Assistant Professor, Department of Library and Information Science, University of Kashmir, Srinagar 190006, J&k, India. 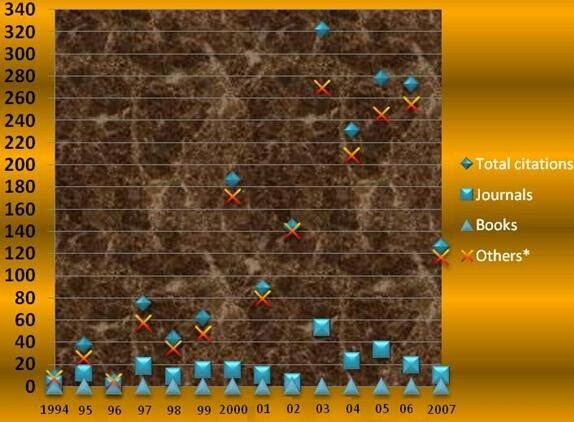 Citation analysis of all the journal articles published in the Library Trends from 1994-2007 is carried out. 593 articles are published in the journal during 14 years. Highest number (52) of articles is published in 2004. The Journal contained 15662 references for the study period of which 13783 are p-citations and 1879 are e-citations. Every issue published approx. 11 articles and each article has an average of 23.2 p-references and 3.1 e-citations. It was found that 44.51 % print books are consulted by the authors and 0% e-books are accessed. Authors have consulted 44.04% p-journals as against 11.82% e-journals. Figures shows that 88.14% other web references are used in the articles reference. Female contribution (52.34%) accounts more than male contribution (47.66%). Periodicals are sensitive indicators of the emerging new ideas in any discipline. A careful evaluation of periodical literature may indicate a complete picture of the discipline. The present study has undertaken one of the renowned journal, Library Trends into consideration with an aim to analyze citations cited by various articles appeared in it. Citation analysis reveals interesting information about knowledge producers in terms their information seeking behavior and usage of various information sources. It can highlight the familiarity, awareness and usage of knowledge producers regarding the online and print information sources. Citation analysis examines the frequency, patterns and graphs of citations in articles and books (Garfield, 1983). Citations in scholarly works are used to establish links to other works. It is one of the most widely used methods of bibliometrics or it is an aspect bibliometrics, and studies reference to and from documents (Gooden, 2001). The benefit of bibliometrics and citation analysis is expressed by (van Raan, 2003) which is reinforced by the studies (Lal & Panda, 1996; Aksnes, 2006) that have used this method of research enquiry to evaluate a library collection. The present studies choose Library Trends for citation analysis. Library Trends is a quarterly journal issued in summer; fall, winter and spring by Graduate School, of Library and Information Science at the University of Illinois since 1952 edited by W. Boyd Rayward. It explores critical trends in professional librarianship. The journal is an essential tool, for both practicing librarians and educators in the professional development and continuing education. to analyze the composition of citations. Das & Sen (2001) analyzed 1049 citations appended to 34 research articles of Journal of Biosciences; 2000. It was found that out of the total citations, journal articles comprises 85.89% and monographs 10.1%. Ramesh & Nagaraju (2000) analyzed the citations provided in articles of Indian journal of Information, Library and Society. 138 citing articles have cited 901 citations i.e. on an average 7 citations were cited per article. About 67.5% of articles had 1-20 citations. More citations were from the books and periodicals than the other type of materials. Similar type of study was performed by Koley & Sen (2003) covering 457 citations appended to 26 research articles published in the four issues of the quarterly Indian Journal of Physiology and Allied Sciences. Of the citations, 76.81% relate to journal articles, 18.59% to monographs, and the rest to conference papers, theses, etc. Rethlefsen (2007) analyzed citation of journal articles authored by Minnesota Department of Health staff. Information on each cited reference was recorded, including reference type, relative age of citation, and journal name. Journals were the most heavily cited format (63%). Bhat & Sampath Kumar (2008) describes a citation analysis of research articles from scholarly electronic journals published in 2000-2006. The analysis focused on the extent to which scholars are using web-based sources in scholarly electronic journals. Results of the study shows that 81.49% of articles published in selected 9 electronic journals during 2000-2006 have web references. Out of 25,730 references 56.54 % of references are print journal references and 43.52% of them are web references. 437 citations in 32 research articles in two issues of the RMJ were collected by Javed & Shah (2008). The study revealed that 49.52 % citations pertained to journal articles and rest to other resource types. All the above studies except the last one reveals that journals are heavily cited and preferred source of information. In the above studies citations of journal articles were analyzed. Other studies have analyzed the citations of doctoral dissertations or masters' theses come up with the following results. Slutz (1997) did a citation analysis of 16 Master's theses. Each citation from the 16 theses was analyzed along the following criteria: gender of citation author; format of citation (book, article within book, journal article, thesis, dissertation); and place of publication. Findings indicated that more male authored citations were utilized; most sources were books, articles within books, and journal articles. Gooden (2001) performed citation analysis of dissertations. The 30 dissertations studied generated a total of 3,704 citations. It was found that Journal articles were cited more frequently than monographs: 85.8% of the citations were journal articles and 8.4% of the citations were monographs. A total of 4,012 citations in 70 postgraduate dissertations in education were studied by Okiy (2003). Most students in education used more textbooks (60.3 per cent), than other forms of library materials. Megnigbeto (2006) studied the citations of dissertations of library and information science undergraduate students and found that the number of citations to Internet resources was very low. The database of the present study comprises of 593 articles published in the journal from 1994-2007. The articles were accessed from Find Articles (website which provides access to articles previously published in over 3,000 magazines, journals, and other sources containing 11 million articles). Each articles published during the study period were examined. The references listed for each article were examined and duplicate references in each individual list were removed. Data concerning total number of articles, total number of references, total number of articles with electronic references, total number of print references were recorded along with the authorship pattern for each article. The gender of authors has been identified by looking at all the forename of the authors one by one. The collected data have been analyzed and is presented in the form of tables and figures as follows. Table 1 shows the total number of articles published from 1994 to 2007. From 14 volumes or 56 issues of the journal under study, the total number of articles published is 593. 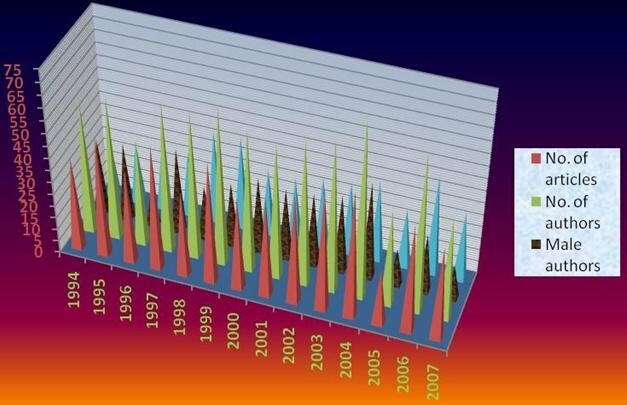 The distribution of articles by volume shows that the number of articles is highest in 2004, with 52 articles. The range of articles published per year during the period under study is between 23 and 52. It is noted that same number of articles (38) got published in the year 1994, 2000 and 2007. The volume-wise distribution of references indicate that the fourteen volumes (56 issues) of the journal contained 15662 references of which 13783 are p-citations and 1879 are e-citations in 593 articles which means that every issue published approx. 11 articles and each article has an average of 23.2 p-references and 3.1 e-citations. 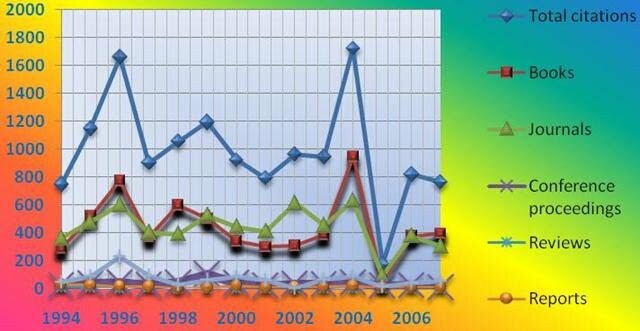 Year wise analysis shows that the highest number of p-citations appeared in 2004 and least in 2005. Whereas e-citations are frequently cited in 2003 and least in 1996 (Table 2). Numbers in parentheses indicate percentage. 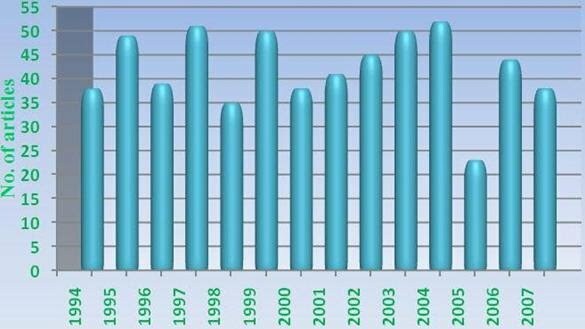 Table 3 indicates that the books are the preferred cited sources in the year 1995, 1996, 2004 with the highest percentage (56.64) in 1998. while as journals are cited most in the year 1994, 1997, 1999, 2000, 2001, 2003, 2005, 2006 and 2007 with highest percentage (63.57) consulted in 2002. Although journals over numbered the books and other sources in most of the years but aggregated figure shows the difference of books and journal citation is in decimal fraction. Largest numbers of conference proceedings are consulted in the year 1999 and least in the year 2007. No article consulted a Review from the year 1998-2002 and from 2004-2007. Others include Magazines, News paper Articles, Thesis and Dissertations, and Reference sources. Table 4 reveals the reliance of author on e-resources. There is 0% usage of e-books by the researchers. Meager number 11.86% of e-journals are cited against 88.14% of other resource types during 14 years. 32% e- journals are cited in 1995 and 0% usage in the next consecutive year while as least percentage (2.77) is used in 2002. In 2007 only 10 e-journals are cited which accounts to only 8% of total citations during the said year. Table 5 finds male dominance in terms of contribution for majority of years but aggregated figures highlights female dominance with contribution of 52.34 % articles during 14 years. Males have contributed more than 50% during the year 1994, 1995, 1997 and 2000-2004. While as female have contributed more than 60% during the year 1996, 1998, 2005-2007. The quantitative growth of articles is in the range of 23-52. Total of 593 articles in 56 issues are published during the period. On an average 11 articles are appended to each issue of the journal. 15662 sources are consulted with greater reliance and usability of print sources with less consultation of e-citations (1879). An average of 23.2 p-citations and 3.1 e-citations are consulted for each article. Further it was observed that the usage of print sources varies when compared and analyzed under various resource categories. The authors have relayed much on books and journals with a difference of decimal fraction in their usage which varies heavily when compared to other resource types. Coming to usage of e resources here the shocking statistics is that there is 0% usage of e-books in 14 years and only 11.86% usage of e-journals as compared to 88.14% of other types of e-resources consulted. Study reveals that Females occupy a more elevated position in terms of contribution. Aksnes, D.W. (2006). Citation rates and perceptions of scientific contribution. Journal of the American Society for Information Science and Technology, 57(2), 169-185. Javed, M., & Shah, S.S. (2008). Rawal Medical Journal - An Analysis of Citation Pattern. Rawal Medical Journal, 33(2), 254-257. Koley, S., & Sen, B.K. (2003). Indian Journal of Physiology and Allied Sciences: An analysis of citation pattern. Annals of Library and Information Studies, 50(1), 23-26. Lal, A., & Panda, S (1996). Research in plant pathology: A bibliometric analysis. Library Science with a Slant to Documentation and Information Studies, 33(3), 135-147. Megnigbeto, E. (2006). Internet-based resources citation by undergraduate students: A case study of Library and Information Science students in Benin. International Information and Library Review, 38 (2), 49-55. Okiy, Rose B. (2003). A citation analysis of education dissertations at the Delta State University, Abraka, Nigeria. Collection Building, 22(4), 158-161. Rethlefsen, Melissa L. (2007). Citation analysis of Minnesota Department of Health official publications and journal articles: a needs assessment for the RN Barr library. Journal of the Medical Library Association, 95(3), 260-266. Copyright © 2009, Rosy Jan.